In July this year, US will start pulling the curtain over its longest war in history. The first phase of troop withdrawal is to begin in July. It will also bring in hope for the struggling Afghans who also want an end to foreign occupation. US presence in Afghanistan has been rather seen as a disregard for the values of a freedom-loving people and a gross violation of international law on sovereignty. America's relations with Asia have been a mixed one. Relations with post-war Japan saw a change after the infamous bombing of Nagasaki and Hiroshima in 1945. Japan's meteoric rise as an economic super power earned occasional wrath of the Americans but relations grew and remain static. Henry Kissinger opened up China for the Americans in early seventies. It has been forty years now that China embarked on the road to modernisation. But the Vietnam episode had been a sour diet for America. Its disorderly withdrawal from Saigon in 1975 was something the US administration would like to forget. Many then envisaged a new Asia policy to emerge from Washington with a broader US withdrawal from this region. But that did not happen. Soviet Union was fighting the Afghan Mujahideens in the eighties. Without much pretence US lend its support to the Mujahideens. After the disintegration of the Soviet Union there has been a huge global imbalance of power. The US had no 'super rival' to deal with. It became the lone power house. The natural outcome was of rescheduling and re-strategising warfare tactics. Following the Soviet withdrawal from Afghanistan in 1989, many expected the US to jump to the rescue of the Afghans, who were virtually left with no economy, a weak administration and broken social order. But that did not happen. The US landed in Afghanistan much later and that too in a military mission. It had a bitter row with Iran during the post Shah regime and still do not have good relations with the present rulers. Post Saddam Iraq is actually a US sponsored period. The entire West Asian region has some sort of relations with the US. It has its military installations and bases in the region. In brief the US enjoys enormous presence in West Asia, South Asia and the Far East. The US economy enjoys the benefits of the petro-dollars that flow in from the rich coffers of wealthy Arabs. 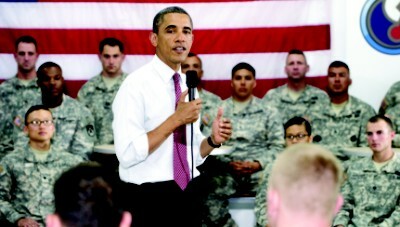 However, many do not rejoice at the news of US troop withdrawal from Afghanistan. They think that the US withdrawal will expose the weaknesses of the Afghan government and stability of the country will be at stake. And add to it sprouting China. The sudden rise of China as an economic powerhouse which is now sweeping the world brings an apprehension in their minds about China's Asia policy, which also includes Afghanistan. Moreover, the fear of China overrunning the Afghan landscape with its aggressive trade expansion and agro technology programme, has already gripped many in the region. The presence of foreign troops is looked at critically. But the situation stands different in Afghanistan. People are talking about US commitment in Afghanistan. They are debating whether the region would be able to rebalance itself, should the US scale back its military presence. Maybe after years of condemnation over its war tactics the US is now looked upon as a saviour. But it can be surmised that the US troop withdrawal from the region may not be necessarily total disengagement with Asia. The US cannot afford to cut off links with Asia or reduce its involvement in socio-economic issues. Moreover, capitalist politics play an important role, which the US upholds. That the US will stay on and continue building regional ties has been confirmed by US Secretary of Defence Robert Gates at the recent Shangrila Dialogue in Singapore. He made it clear that US won't leave anything solely in the hands of China. He promised to increase the number of US warships deployed in Singapore. He also hinted at the US wishes of improving multi military cooperation with nations of the region. Interestingly, the Asian nations, mostly emerging economies, want the US to continue its presence in the region through various cooperation pacts. It could be naval bases, free and open commerce, building of democratic institutions, airspace and cyber space etc, on top of all counterbalancing China's increasing might. Mongolia, Vietnam, Malaysia, Australia, Indonesia, Philippines, India Thailand and South Korea all regard a US military presence in the region as essential. There is a fear working in the minds of the leaders of the Asian countries. It is the fear of massive Chinese takeover of the region. As it is, China is strong militarily; its fast expanding economy might make things more difficult for others. They fear that these smaller countries might get fully dependent on its giant neighbour. The economic dependence might automatically turn into political submission. Hence they think the US should have an explicit Asia strategy. And this policy should be spelt out in clear terms by the incumbent President. They fear that if the US delays in reaffirming its commitment to Asian needs, it might be construed by China as America's inability to bear the Asian burden. Meanwhile, it is first the Asian nations that should decide what would be the political and economic structure that will suit their needs. The leaders should not look up to the US for solving all their problems. Moreover, all Asian problems will not match American solutions. In fact, the big powers of Asia, like, China, Japan and India should rather engage in dialogue and set their priorities right. They should realise that Asia is a growing economic strength and it will soon have a clear sway over the global economy. America can help them find local solutions rather than making them swallow the western pill. If China is taken in confidence and if it believes in peaceful coexistence, things in Asia might look bright politically. China's ambition should be made known to its neighbours and it should show maximum restraint in dealing with them in times of crisis. Its military build up should not reach to threatening levels, and the territorial disputes with India, Japan, Vietnam and Philippines should be solved amicably. China ought to convince its Asian neighbour that it poses no real threat to its economy or politics. Some experts opine that the American military presence in Asia has contributed to its economic growth. And America needs to establish a long term relation with the region to keep the momentum of development going. Places like Afghanistan and Iraq have different stories. Unlike the tranquil East, West Asia has a heated political atmosphere. So Afghanistan will require more time to cool down so would Iraq. Before the full withdrawal of US forces from Afghanistan in 2014, the best contribution that the US can make is to help create a genuinely efficient class of administrators, strong democratic institutions, a well trained army (not stooges) with modern weaponry, a strong economy based on local resources, and an ideal education system. After all, the US policy in Asia should be based on foundations of trust. With a healthy Asia, the US can only gain.